JACOBY’S STOREHOUSE – Where once, bow-tied ice cream specialists dispensed cones and sundaes, and more recently accepted Christmas wishes, an artisinal Italian food shop is in the making. One of two prominent storefronts in Jacoby’s Storehouse, vacant since the departure of Bon Boniere in September, is being reshaped into something deliciously different. “We are definitely breaking the ice cream DNA,” said Bill Chino, co owner of Jacoby’s Storehouse. PastaLuego will take take-and-bake to a whole new level, with a richly-stocked Italian market with an on-site pasta-making facility. Basically, you’ll be able to get almost all the makings for a fresh, deluxe Italian dinner. “We make it fresh, you cook it later” is the store’s slogan. Then, newly-hired PastaLuego manager Jake Drake made the transformational suggestion that the shop include pasta manufacture. The front of the store will offer an abbondanza of hearty Italian meal-makings – cheeses, meats, breads, sauces (fresh and jarred), olive oils, polenta, even gelato. “Traditional products with a new flair,” Chino said. Or maybe you’d rather have a freshly made Italian sandwich, or pick up some Italian cookware. “We’ll be able to sell you your own pasta machine,” Chino said. Even gift baskets will be available. The back, or south portion of the store is where a variety of fresh pastas will be made – linguini, fettuccine and capellini and even stuffed pastas like ravioli, agnolotti and tortellini. “All the ‘-inis,’” Chino said. This being Arcata, they’ll be organic and made with fresh, local ingredients and seasonings. Staff will be able to recommend proper pairings of pastas, sauces and cheeses. What it can’t make, PastaLuego will import and offer in dried form. “There are probably 150 pastas,” Chino said. “We can’t make them all.” These exotic varieties include squid ink and tricolor pastas. Several machines will roll out and cut the pasta, which will dry on racks with the whole operation visible to Storehouse lobby lingerers. The spectacle is part of the shop’s marketing. “It will add foot traffic to enhance business for all the other retail tenants,” Chino said. Synergystically enough, PastaLuego will produce the pasta used in the Abruzzi restaurant downstairs. The shop’s decor will present a “relatively formal” look, with Italian art and photos. The staff may wear white chef jackets, though no bow ties are planned. Drake said the store is committed to operating as waste-free as possible, with reusable materials. “We want everything as green as we can get it,” she said. 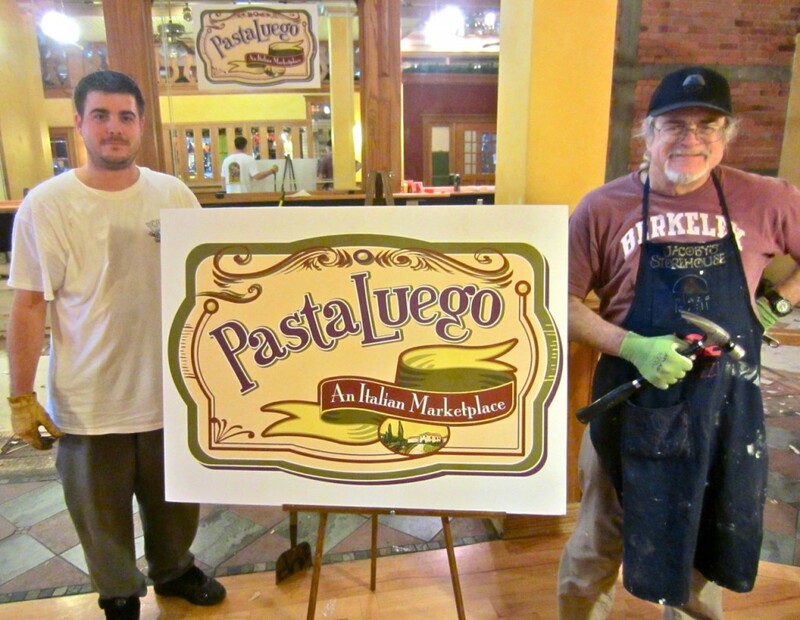 PastaLuego is set for opening this spring. This entry was posted on Sunday, January 6th, 2013 at 4:49 pm	and is filed under Community. You can follow any responses to this entry through the RSS 2.0 feed.